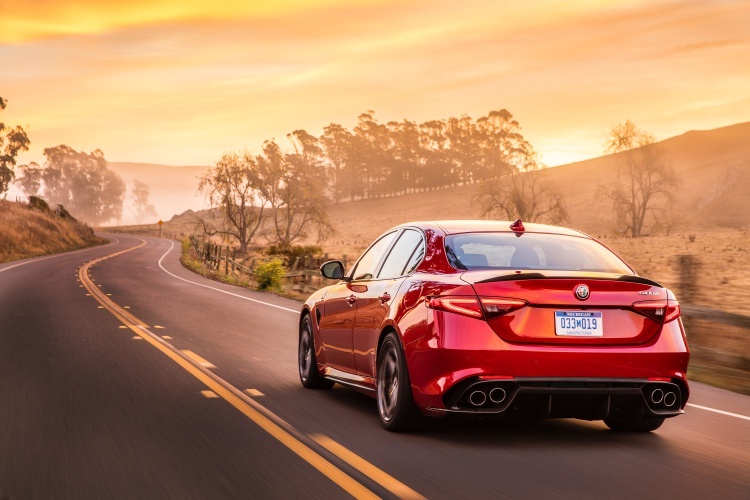 Alfa Romeo took a Ferrari V8, made it a V6, tuned it to hell, and placed it in a sedan based on an all-new platform. It’s not a hallucination. 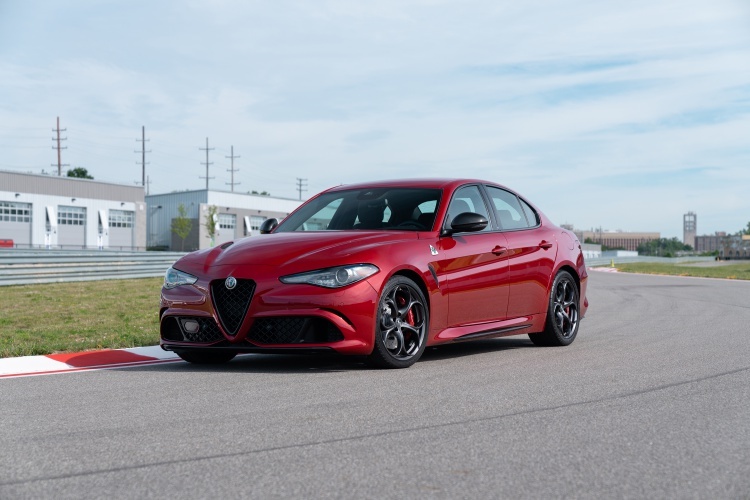 It’s Giulia Quadrifoglio. There are days when I recall certain people for what they mean/meant to the world. One such guy I fondly remember is late FCA CEO Sergio Marchionne. I did write about him on Medium and you can check that out. 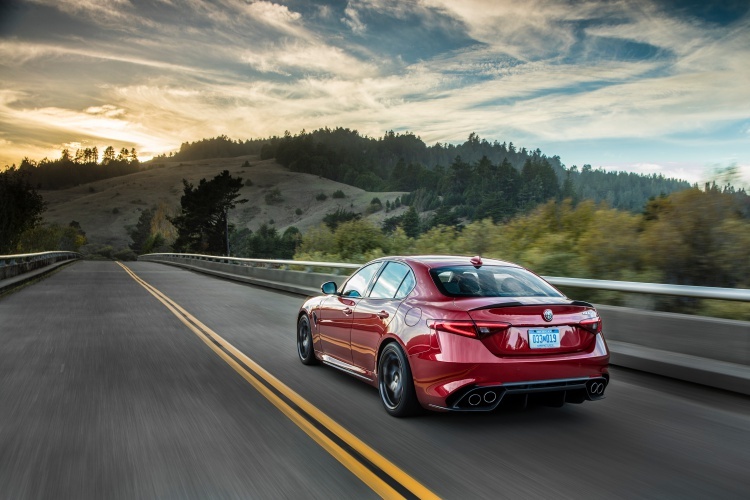 Whenever I think of Marchionne, I always think of his impact on the automotive industry. 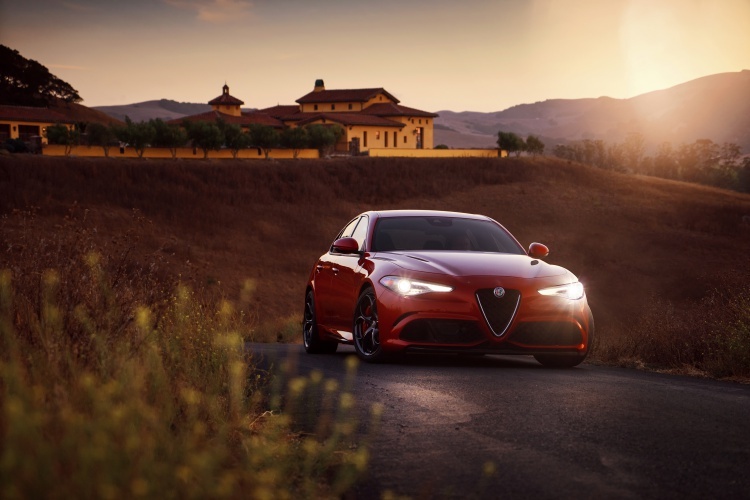 Under him, so many things happened – Ferrari went public, Alfa Romeo returned to USA, Dodge made history with both Viper and Challenger – things that no one could see coming even if they were informed in advance. 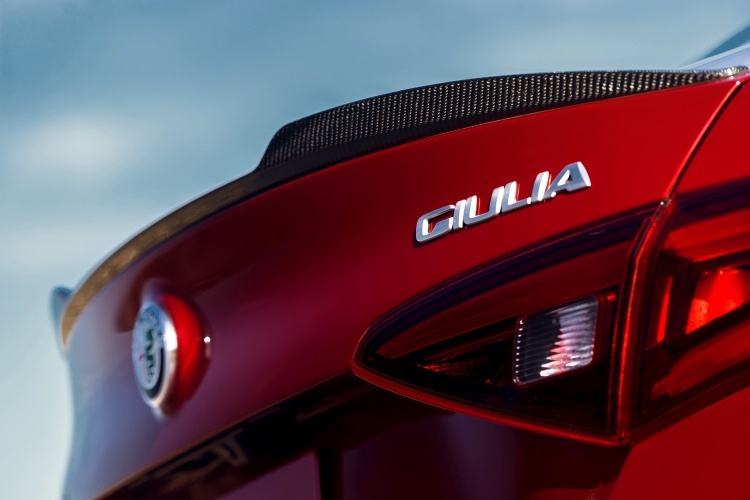 This is the light in which I will talk about the Alfa Romeo Giulia Quadrifoglio (spelled Folio, not Foglio). 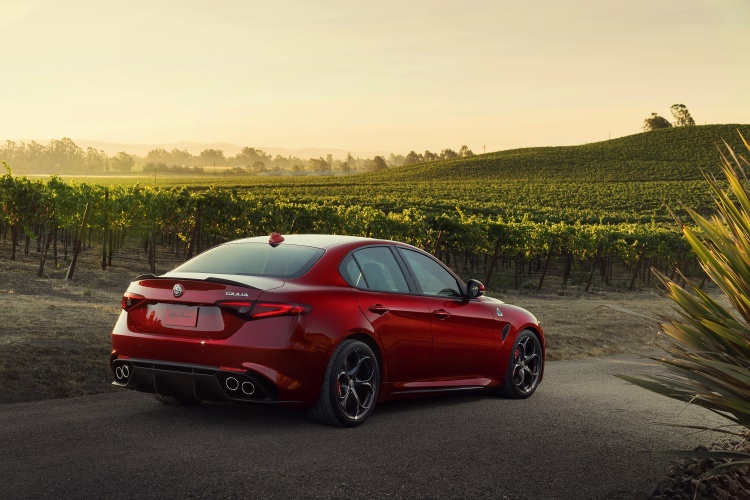 It has been a lucky charm for Alfa Romeo, literally and figuratively. Let me tell you how. 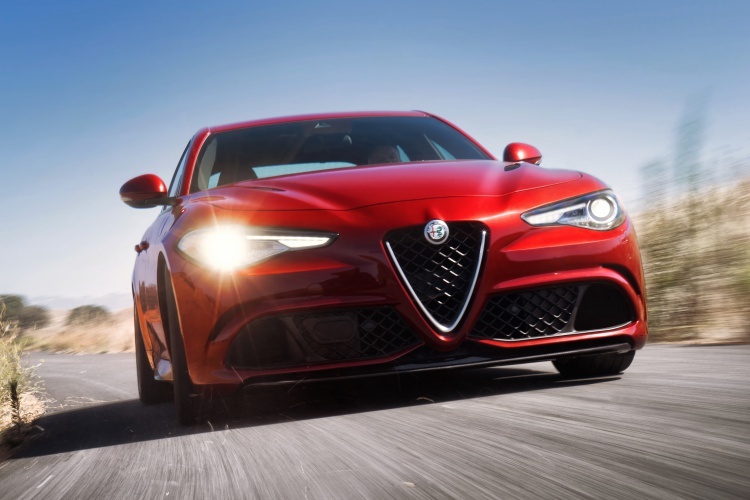 What’s new about the Alfa Romeo Giulia Quadrifoglio? 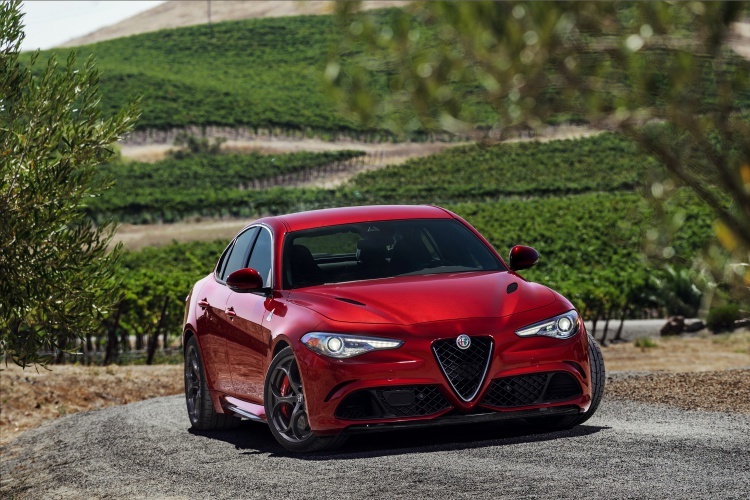 The Alfa Romeo Giulia Quadrifoglio is not a new vehicle, at least in the markets it is sold in. However, that doesn’t mean it isn’t modern. 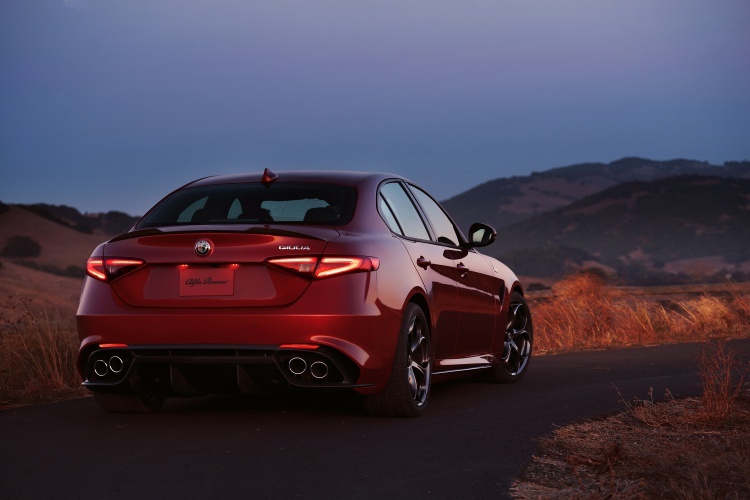 It rides on an all-new platform called Giorgio. 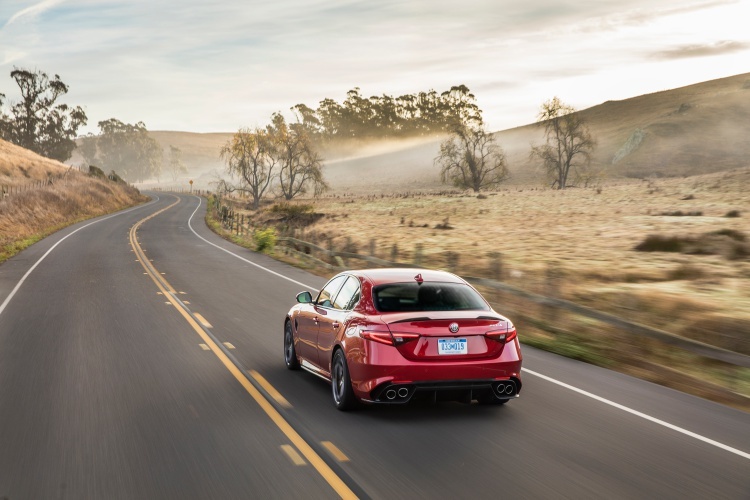 To provide more clarity, the Giorgio platform will be shared by Maserati, Dodge, and Jeep brands too. Suffice to say, the Giorgio platform has to deliver. It can’t be a black hole for FCA’s time and resources. 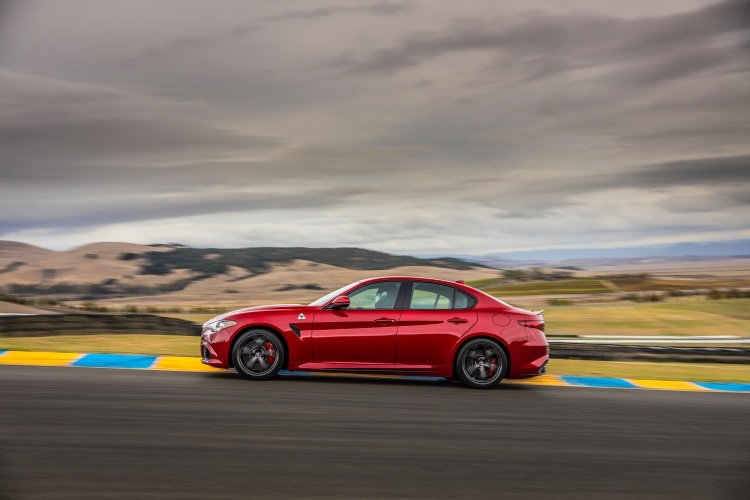 That should also give you an idea of what the Giulia Quadrifoglio has to do – it has to be the best car in its segment. With that said, this car does a few things right at the get-go. The first thing it does right is that design. 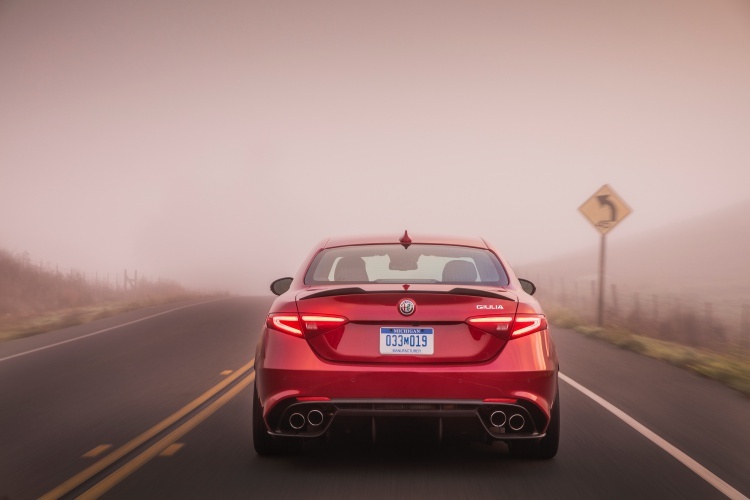 The car’s silhouette is that of a traditional three-box sedan. In execution, it feels more like two-and-a-half boxes. 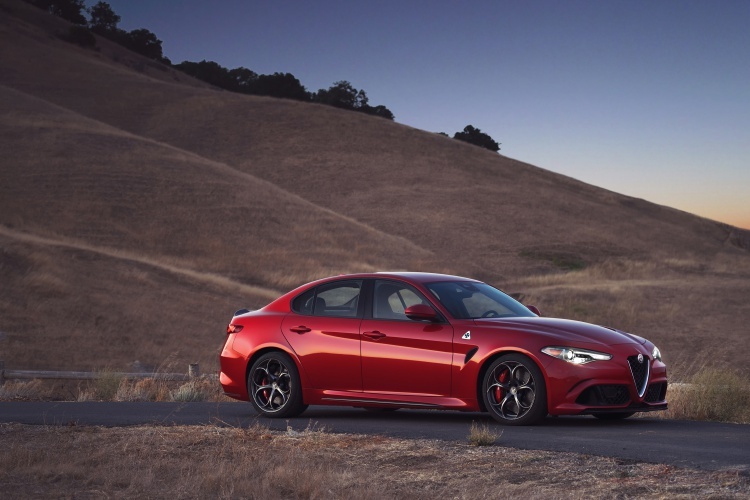 However, this approach works here because it gives this four-door sedan a sense of agility and compactness that would otherwise be lost. Mind you, it is a long car at 4,643mm. 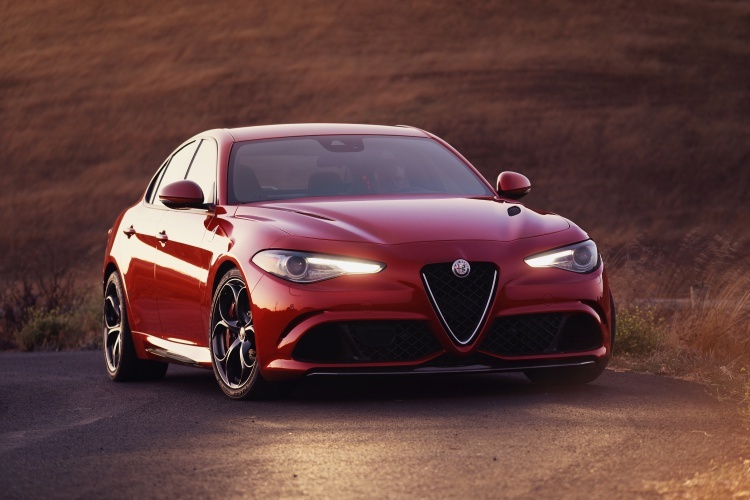 Long or not, it doesn’t look as muscular as its rivals. 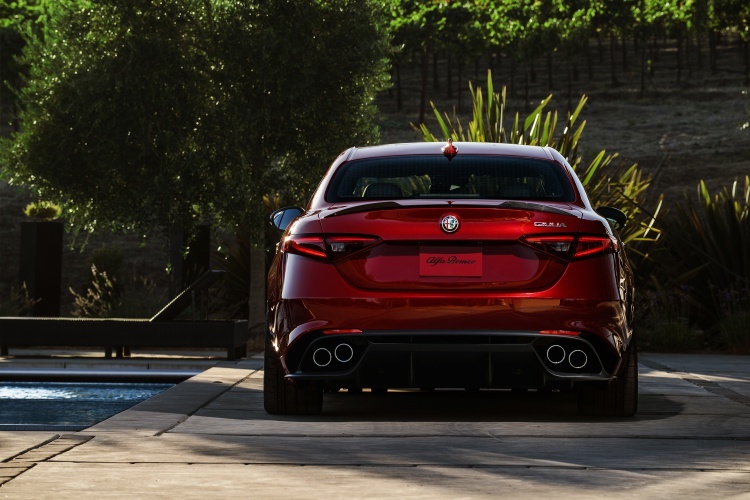 Alfa’s design team has to be credited with making a sports sedan that looks lean and agile, not muscular and porky. Short overhangs, taut surfaces, and staying away from highlighting areas like hood and wheel arches help in this regard. The car feels small and narrow (it measures 2,024mm with mirrors). Speaking of taut surfaces, look at those sharp creases on the hood and on the sides. 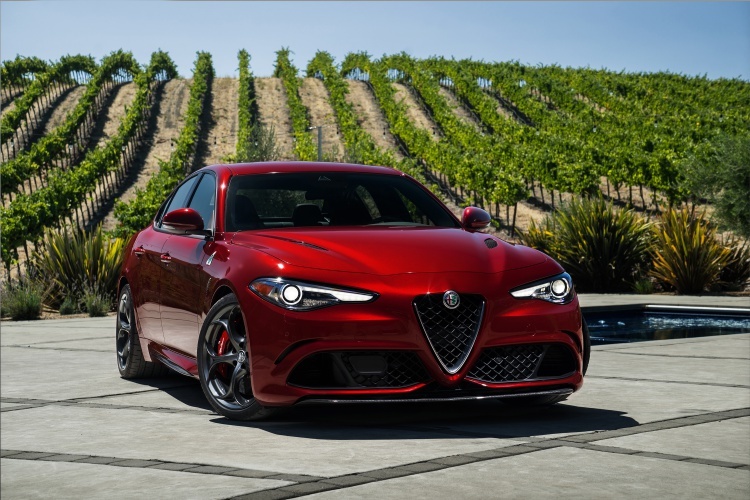 Styling elements do make the Alfa Romeo Giulia Quadrifoglio’s design stand out. 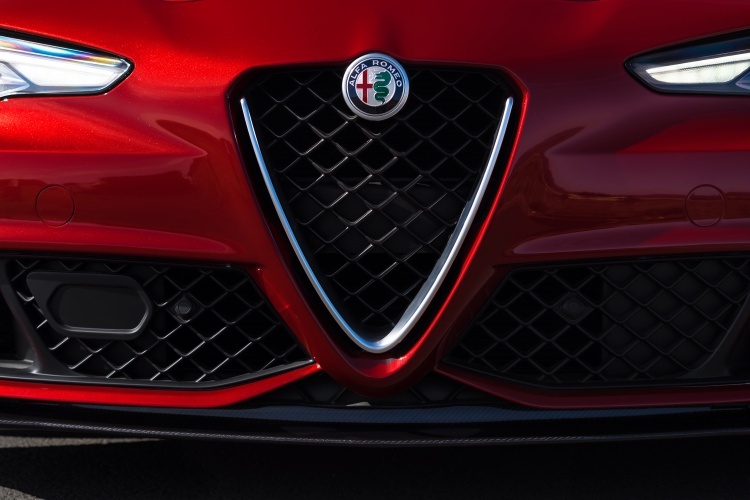 Up front, the triangular Alfa grille is flanked by big air intakes on either end. They seem to be frowning, but whatever. 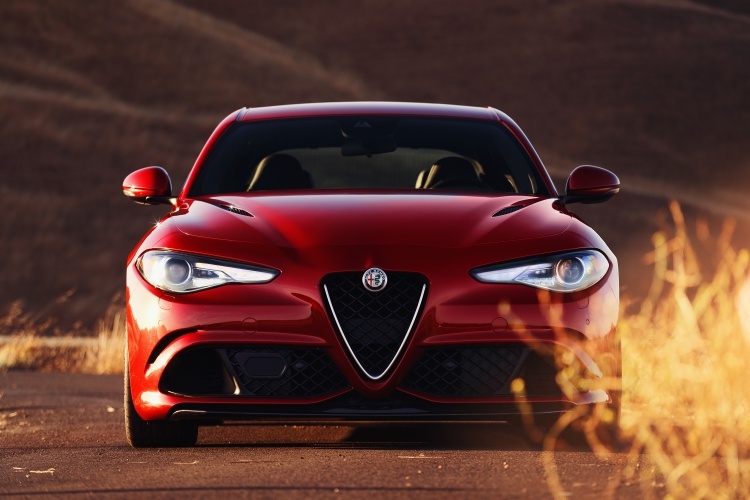 The sleek headlamps make the front end look sharp. 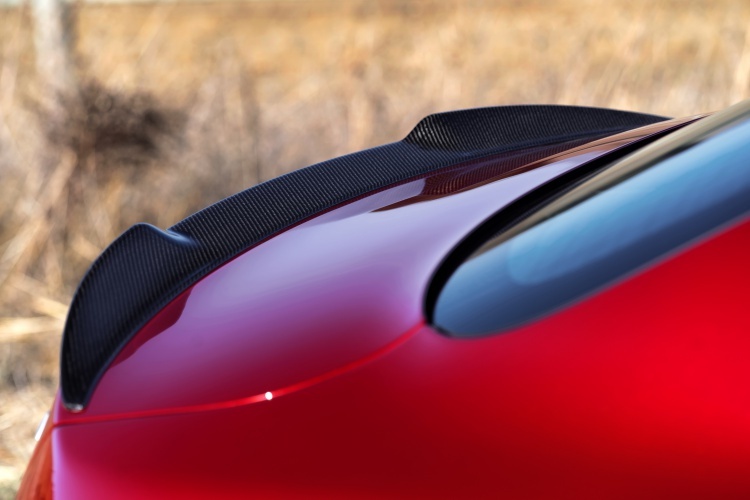 Below the air intakes sits a carbon fibre splitter for active aero purposes. If you look closely, right above the air intakes sit small slits on either side. On either side, there is a four-leaf clover badge. That badge is this car’s calling card, a proof that it is special. How special? BMW M, Volvo Polestar, Mercedes-AMG special. 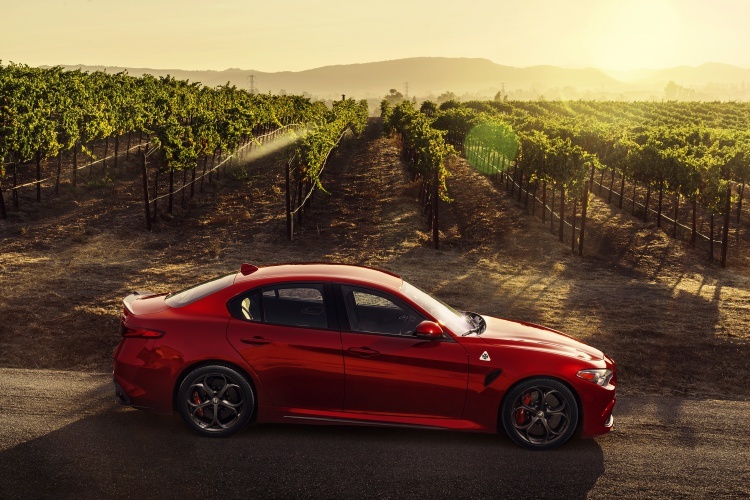 That’s the Quadrifoglio mark on the car. A side note – that four-leaf clover is considered a good luck charm. Below this badge sits a vent. 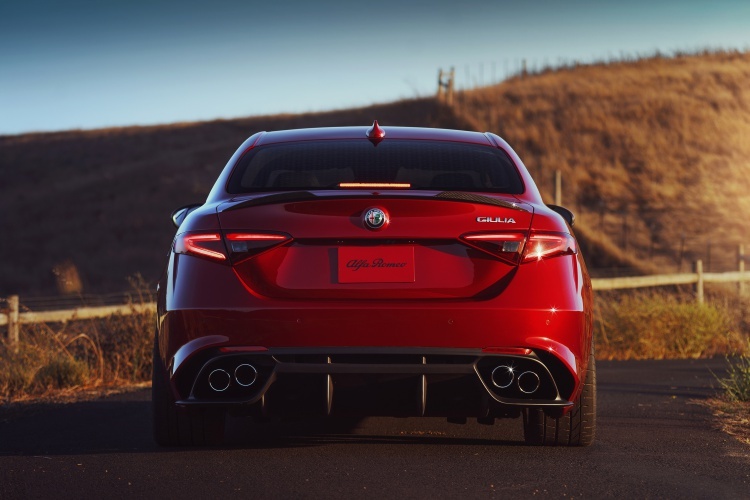 At the rear, you can spot the deck-lid spoiler, twin wrap-around taillamps, quad exhaust ends (two on either side), and a diffuser. 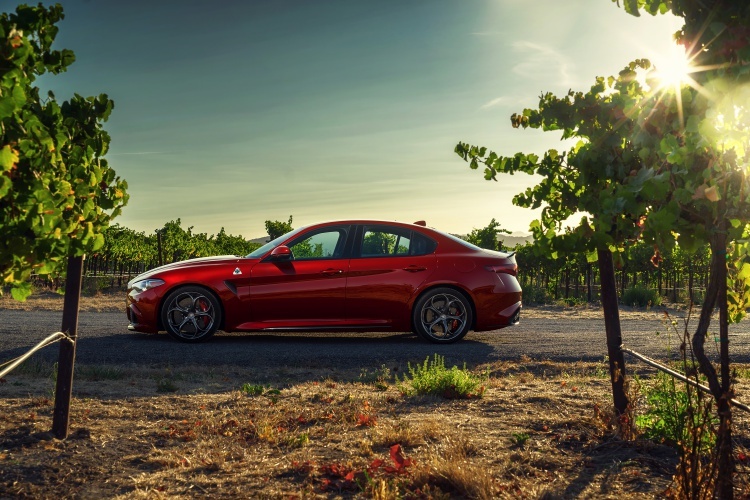 My favourite exterior design aspect of the Giulia Quadrifoglio is its roofline. 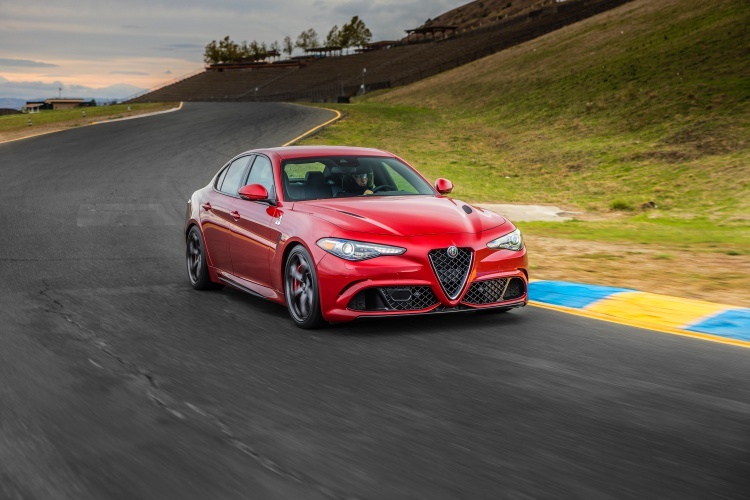 It slopes down gradually, adding a sense of ease to the car’s design. 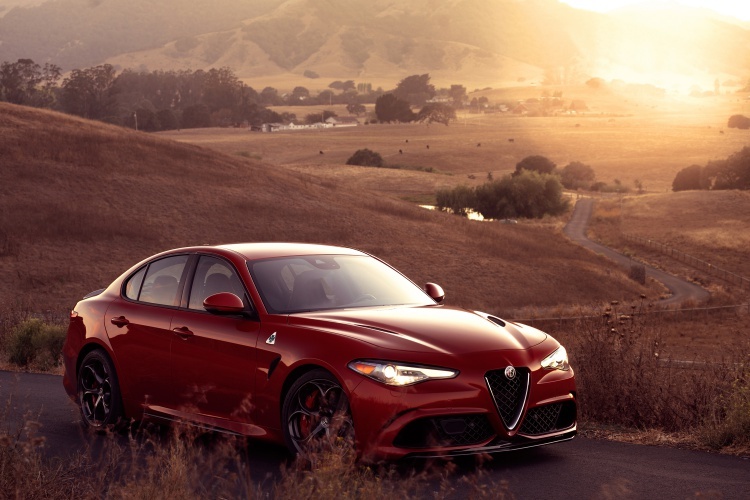 This is critical for owners who look for a fast yet practical car. A fastback roofline looks great and all but it cuts into the rear-seat headroom. 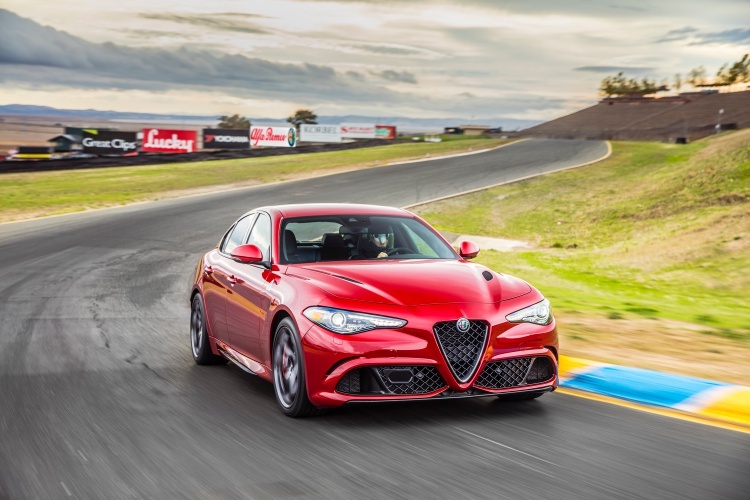 The Giulia’s roof doesn’t seem to cut into passenger headroom. 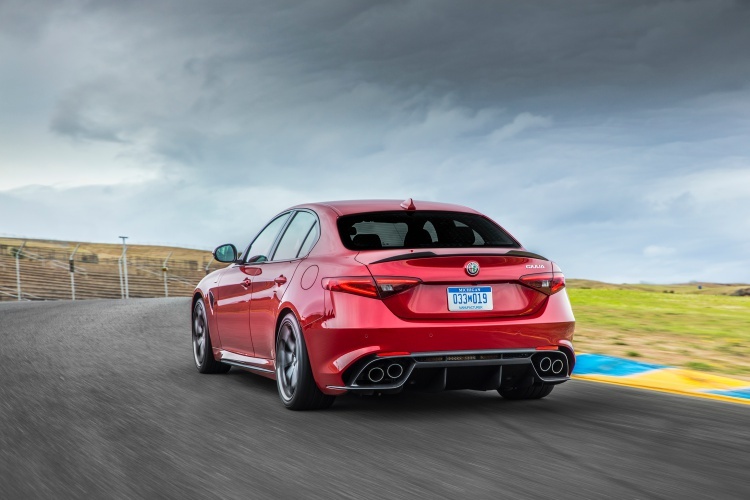 It helps that it makes the sedan look sedate and practical instead of overly sporty unlike a certain German infamous for its four-door coupe body style (I am talking about you, the soon-to-be-outdated CLA). 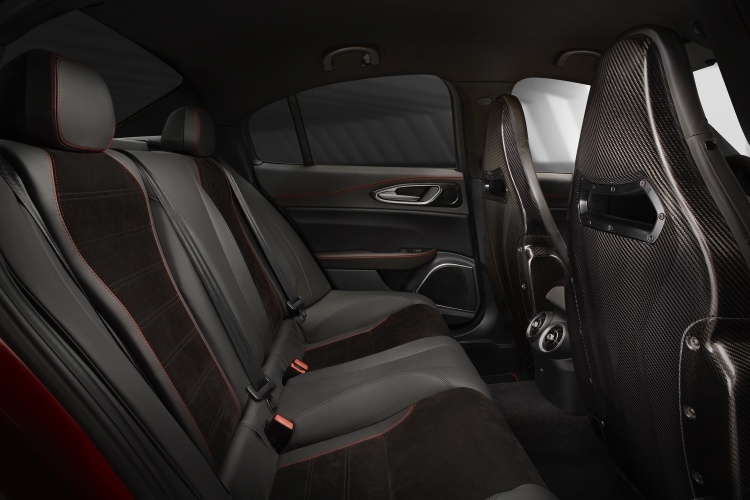 Moving on to the interior of the Alfa Romeo Giulia Quadrifoglio, it is a nice place to be in. 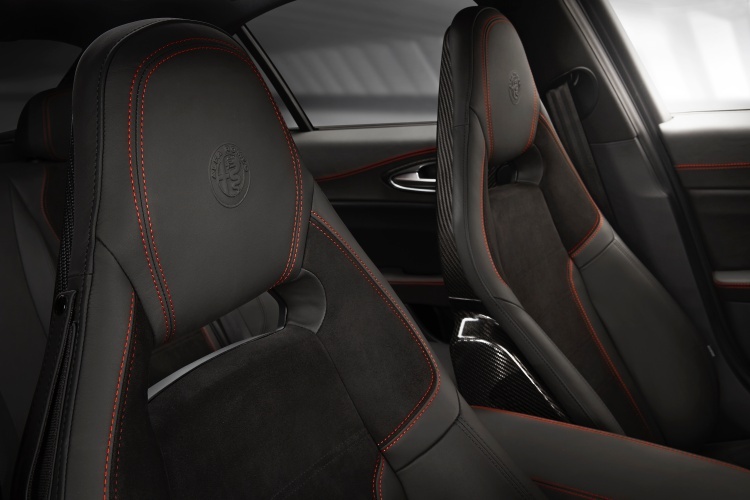 I like all-black interior schemes and I like this one too. There is contrast stitching to be found here (available as no cost option). 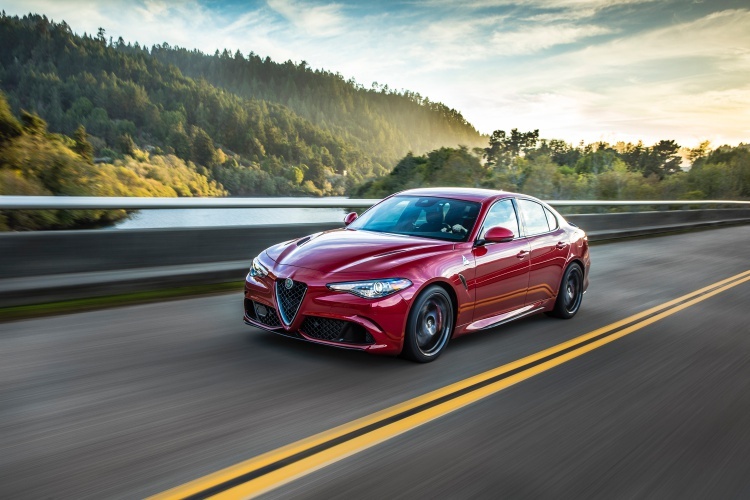 Brushed aluminium pieces like the Alfa DNA Pro Drive mode selector surround, steering wheel insert, and steering column-mounted paddle shifters break the all-black monotony. Also, for no extra cost, you can have the dashboard and door trims finished in either Black/Red or Black/Ice colours. The dashboard slopes down nicely as you move away from driver’s instruments. The twin-pod instruments flank a digital screen. 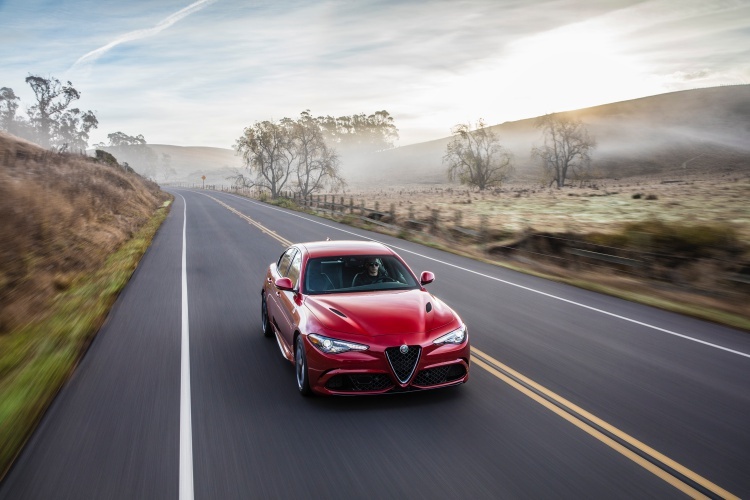 From here, you are led to an 8.8-inch infotainment screen while the dashboard continues to slope downward. You get carbon fibre inserts in areas like passenger side dashboard and steering wheel. Or, like I configured mine, you can have the steering wheel finished in carbon fibre too. However, why would anyone do that is the question? 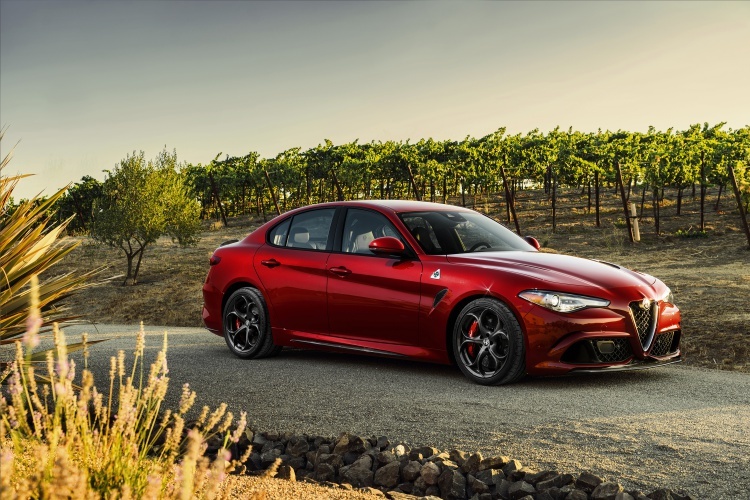 Coming to the seating, the car can be had with leather and Alcantara seats (with heating) or Sparco carbon fibre racing buckets without heating. 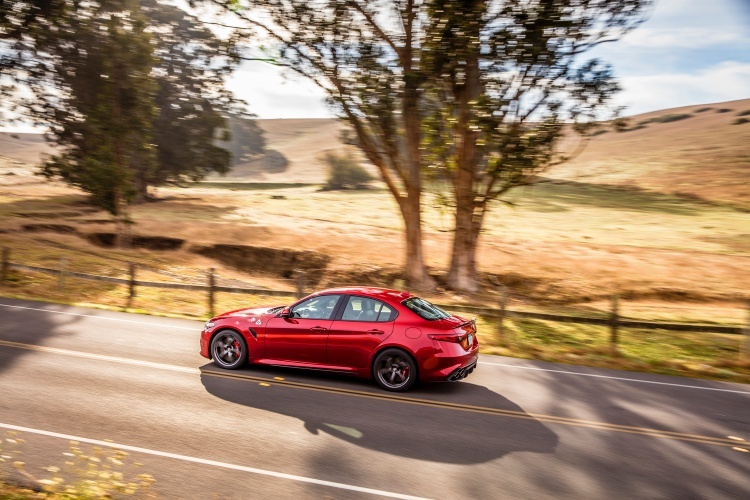 The Giulia Quadrifoglio’s interior is a nice place to be in. My favourite bit of the cabin is that steering wheel-mounted engine start/stop button. It just conveys a sense of occasion in this car, helping it stand out from its rivals instantaneously. 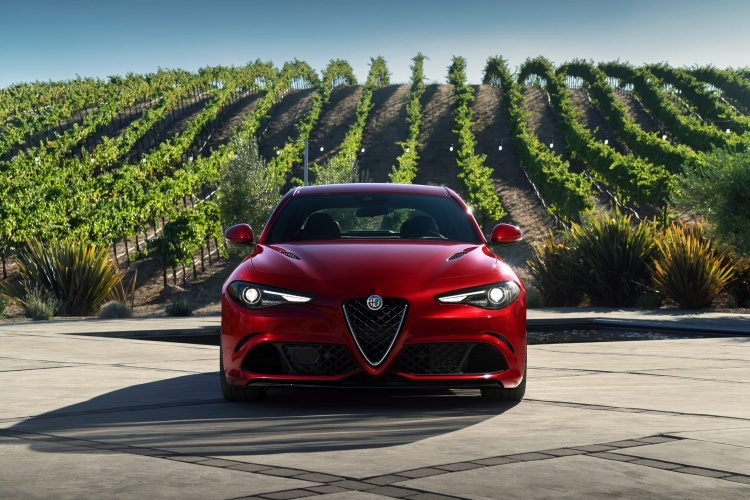 The heart of the Giulia Quadrifoglio is nothing short of amazing. It is a DOHC, 24-valve, direct-injected, twin-turbocharged, all-aluminium 2.9-litre 90-degree V6 petrol motor. 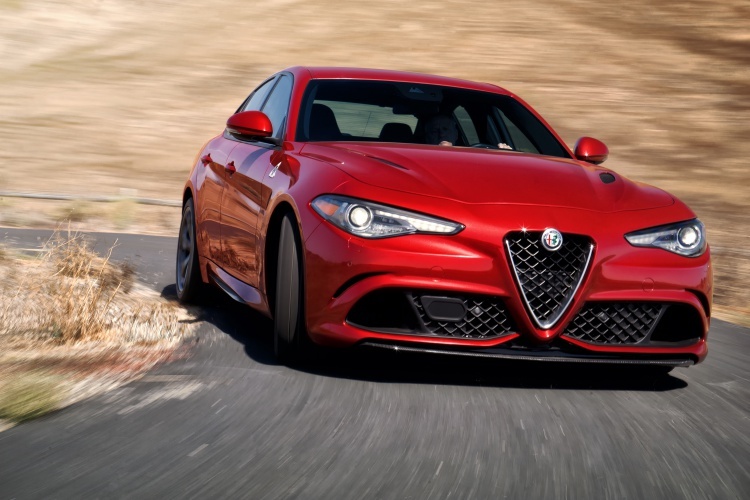 This is a Ferrari-derived engine, per Alfa, but I could care less. It makes a manic 505HP (or 510HP in Euro spec) and 600Nm torque. 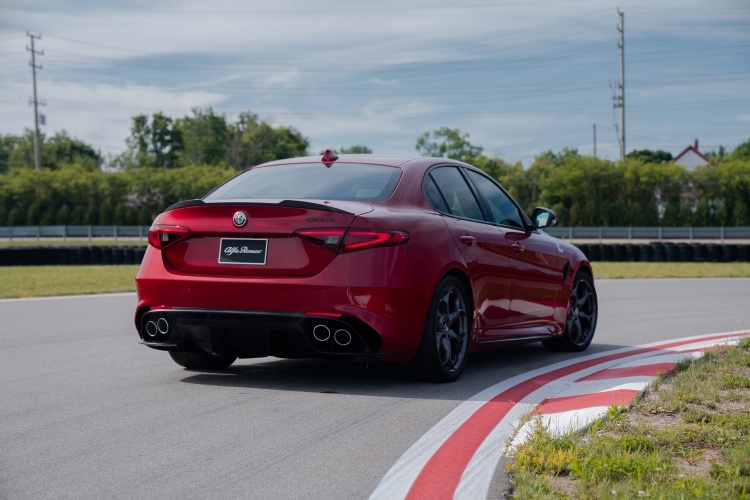 It features mechanical cylinder deactivation on the right bank. 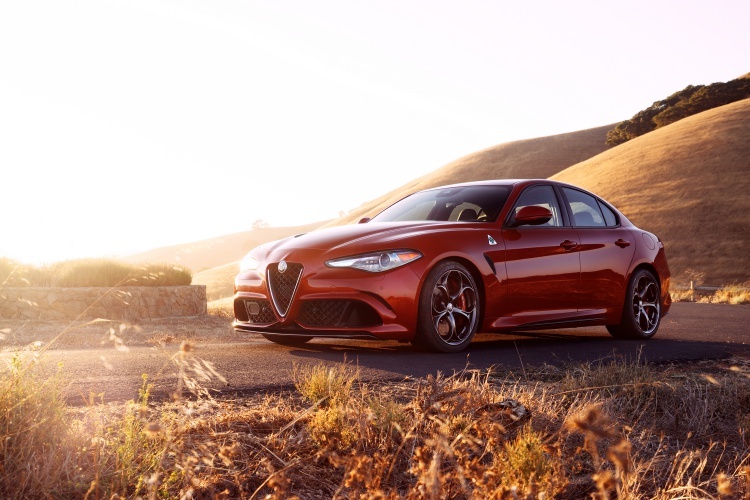 Depending on the continent where you live, you can get it with either a 6-speed manual or an 8-speed automatic which power the rear wheels. Slightly unlucky folks, like those in the US, will have to make do with the 8-speed automatic only . 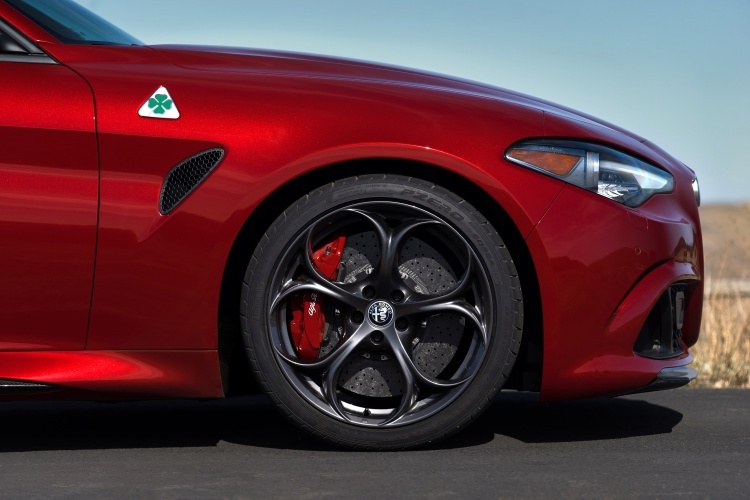 Available with the Alfa Romeo Giulia Quadrifoglio is Brembo carbon ceramic disc brake system as an option (390mm discs up front and 360mm units at the rear; two-piece units at either end). The car gets carbon fibre roof and hood, rocker panel, and rear spoiler, apart from the front splitter. I have no idea about the weight savings they offer. 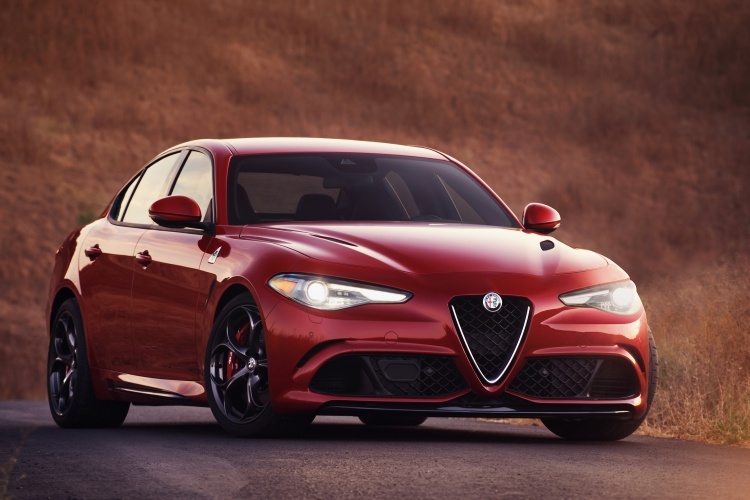 It’s a four-door sedan so I don’t care either. 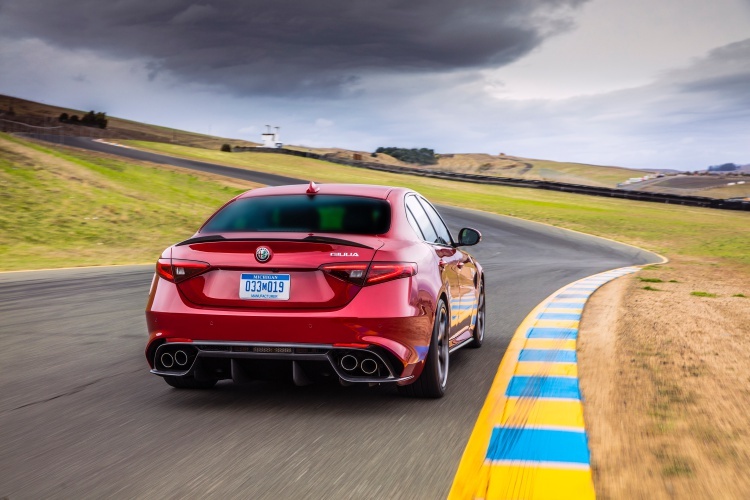 It also gets torque-vectoring twin-clutch rear differential, adaptive damping system, brake-by-wire system, and has 50:50 front:rear weight distribution. Now, I like the torque-vectoring and weight distribution bits. All functional, sports car stuff here. 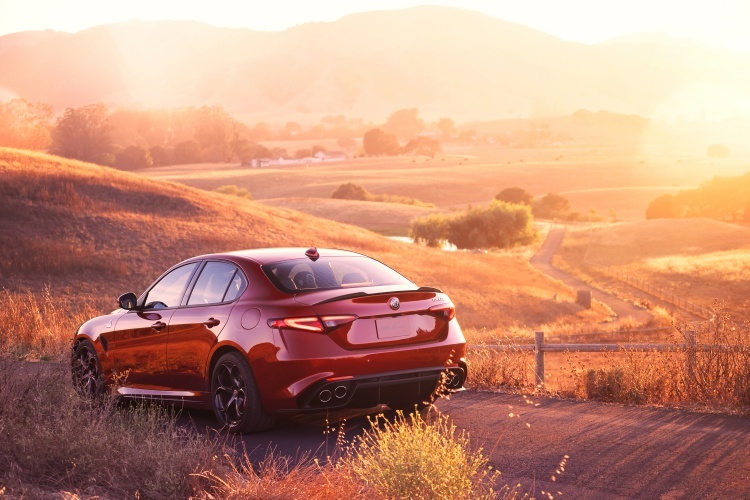 Driving aids on the car include front and rear parking sensors, blind spot monitoring, forward collision warning, adaptive cruise control, lane departure warning, hill start assist, and more. Quite safe, don’t you think? Most importantly though, it has that Snake and Cross badge on the hood with the Four-Leaf Clover badge on the sides. 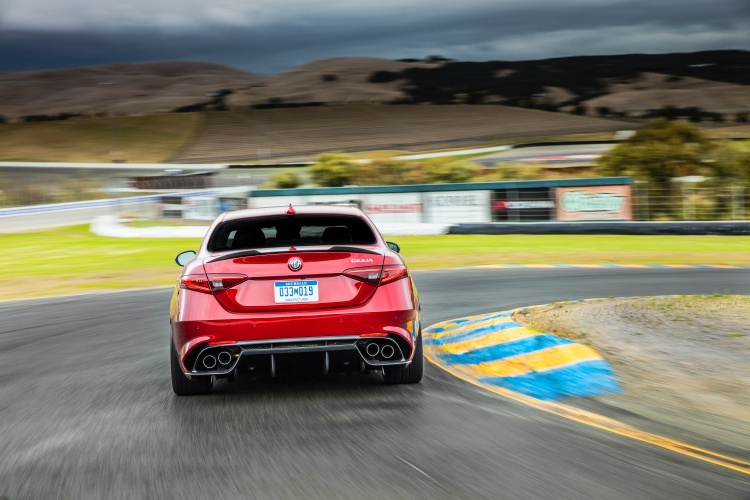 That’s the most clear sign that this car is unlike any other on the road. 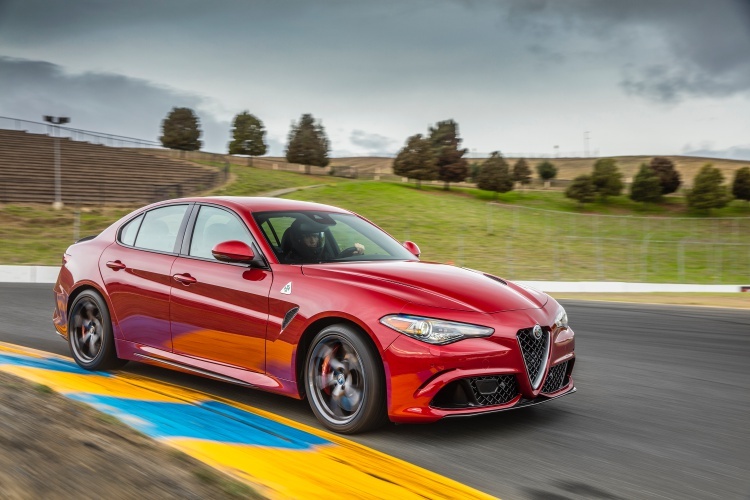 Is the Alfa Romeo Giulia Quadrifoglio worth consideration? 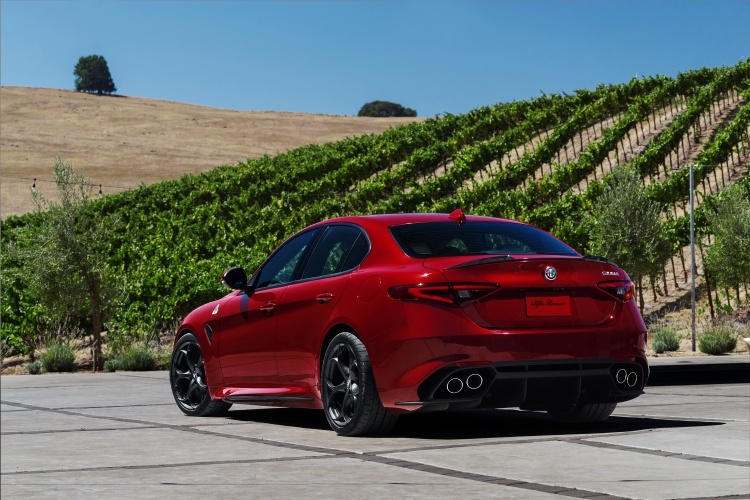 I am a mark for cars like the Alfa Romeo Giulia Quadrifoglio. They are practical for daily use and when the time comes to kick things up a notch, they are fun too. 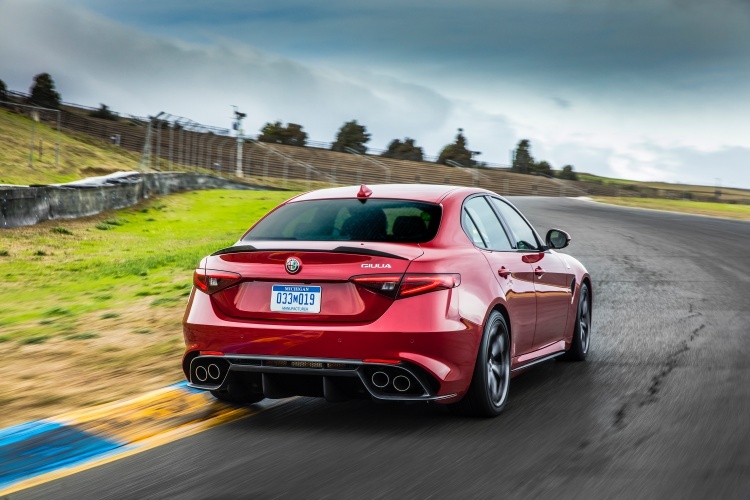 That said, if I have to pick just one car to stand in my garage that can be driven daily, the Giulia Quadrifoglio is something I’d strongly consider. It looks great, has gone around the Green Hell in 7:32 minutes (holds a record too, btw), and has four doors. Those are just some reasons why I’d even consider it over something like the Dodge Charger Hellcat that makes over 700HP power. However, when it comes to price though, the Charger Hellcat is unbeatable. 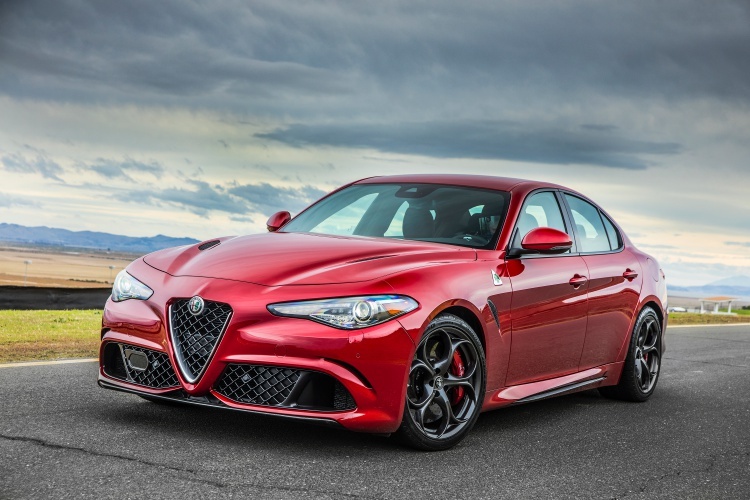 However, I also have to consider the Giulia Quadrifoglio alongside my all-time favourite one car garage pick, the Porsche Panamera. In that comparison, I’d pick a Porsche only on two conditions – if luxury is my top priority and, more importantly, I can shell money on Porsche’s options. Previous: Previous post: Will you pick Genesis over Germans? Next: Next post: Hey, Skoda! Bring Scala to India please!